In its detailed, interpretive reconsideration of Adler's involvement with Freud and psychoanalysis, In Freud's Shadow constitutes a seminal contribution to our historical understanding of the early psychoanalytic movement. Making extensive use of the Minutes of the Vienna Psycho-Analytic Society, Freud's correspondence, and the diaries of Lou Andreas-Salome, Stepansky reconstructs the ambience and reanalyzes the substance of the ongoing debates about Adler's work within the psychoanalytic discussion group. One valuable by-product of his undertaking, then, is a compelling portrait of the early Vienna Psycho-Analytic Society from the standpoint of the sociology of small groups and, more especially, of Freud's status as the "group leader" of the Society. 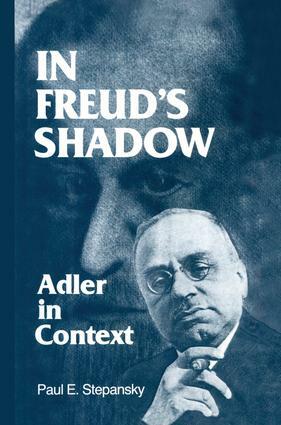 Thoroughly researched, meticulously documented, and brilliantly written, In Freud's Shadow: Adler in Context represents a watershed in the literature on Adler, Frued, and the history of psychoanalysis. It will be of major interest not only to psychoanalysts, psychiatrists, and psychologists, but to social scientists, historians, and lay readers interested in the politics of scientific controversy, the sociology of small groups, and the relationship of psychology to contemporary systems of belief.